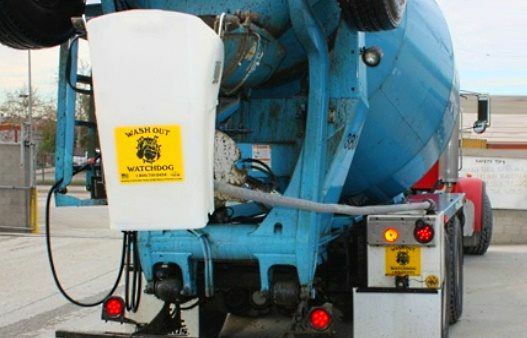 The Porta-Pit is a new, superior concrete washout container that was designed specifically for easy use, portability and “no spill” security. The main body is constructed of industrial strength, cross linked polyethylene plastic that is ideal for containment of all washout water and materials. With the Porta-Pit, the washout materials can then be handled on the jobsite (with the proper procedures) or can be securely transported from the job site to a different location for easier processing. It features a baffled lid that is designed to seal the contents in the container with our silicon seal and ratcheted lid locking system. This locking lid system traps all water inside the bin and prevents it from escaping during transport. We also have custom made trailers available for our bins. The Porta-Pit does not require special oils or releasing agents to coat the interior prior to usage. Due to the fact that concrete does not adhere to the cross linked plastic, it will not rust, corrode or dent (unlike steel). 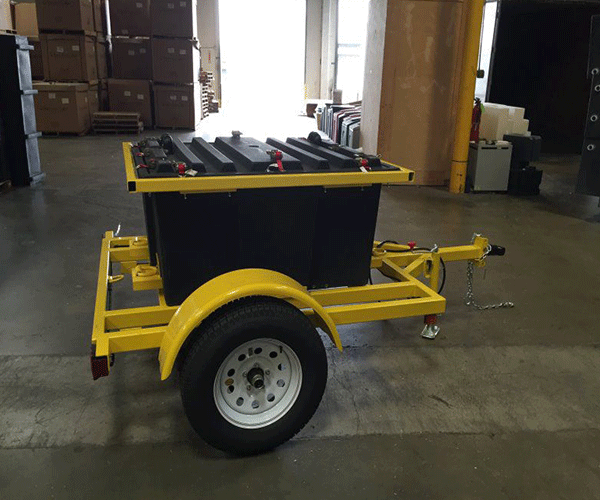 It is constructed from an industrial strength, heavy duty, rotomolded plastic that makes the Porta-Pit incredibly durable yet light weight for easy handling (i.e., moving around the jobsite) and emptying of contents. It is also far more cost effective to manufacture and ship. One of its greatest advantages is that it does not require the water to be drained prior to transport (due to our specially designed lockdown lid). If the contractor decides not to process and remove the water on the jobsite, it allows anyone with a truck or trailer to transport it to another location that is more convenient to process and recycle the contents. Portable bins of the past required a pump truck to pump the water out before the pit could be moved. Now with Porta-Pit, you simply put the lid on and haul it away; materials, water and all! It can also be used as an evaporation pit. It has a 10-inch screw in the middle of the lid that can be removed to allow water to evaporate over time. When dried, simply dump the materials out and start over. Pumpers: The Porta-Pit also serves as a perfect container for pumpers to discharge into when priming the pump to prevent the concrete from splattering all over. It features a removable 10 inch lid to allow the hose inside the closed bin in order to prevent the contents from escaping or splattering. The Porta-Pit is ideal for contractors and pumpers who need to take responsibility for washout water and materials on a job site. Durability – Porta-Pit is made of a revolutionary cross linked polyethylene ( five times stronger than ordinary polypropylene plastic) and heavy duty steel runners and supports. Light weight –Porta-Pit weighs approx. 250 pounds empty and can be moved by hand. Small footprint – The 1.5-yard Porta-Pit is about the size of a pallet at 44 x 42 inches, and is 40 inches tall. The Boom Pump Bin is designed to slide under pumps and pump trucks and is only 12 inches high. The Boom Box, is designed for boom pumps and small rock pumps to capture and contain spills. Stackable – Porta-Pits may be stacked for easy storage..
Pumper’s Friend – For use when priming or washing out pumps, Porta-Pit has a removable 10 inch lid to allow the hose inside the closed bin to prevent the contents from escaping or splattering. No lubricants required – concrete does not adhere to the plastic used in Porta-Pit. Compared to larger portable concrete pits currently in use, Porta-Pit is easier to move and transport, more versatile (different sizes for different uses) and less expensive. Most steel containers are larger and require the water to be pumped out before they can be moved, and require releasing agents or coatings. The Porta-Pit may be moved with a forklift or truck without draining. Due to their affordability, several can be placed around the job site for convenience. One lucrative idea for the Porta-Pit is that concrete producers could provide a service to their clients that is currently in high demand. The producers could purchase their own truck in order to pick up and deliver these portable pits for a reasonable fee. They could then bring all the materials back to their plant and recycle them. This would result in saving billions of gallons of water globally, by reusing every rock and grain of sand; along with the cement water in future loads of concrete. Quite frankly, no one else on the planet is better equipped to handle the materials that are produced in the washout process than the concrete producers themselves. There’s a tremendous amount of money to be made providing this service at the same time completing the recycling cycle. The Porta-Pit can be utilized for multiple reasons due to the fact that you can simply put the lid on it and haul it away without worrying about water/liquid spilling out. One of its most important features is that it has a small footprint and it is easily moved when partially full or when not in use. They stack on one another when they are empty. They weigh about 250 pounds empty so they can be moved by hand. The Big Dog Bin is the size of a pallet, so 3 bins stacked on one another would only take up a pallets worth of space, and can be stored anywhere out of the way. Once you fill one of them up, you can put the lockdown lid on it and move it out of the way, grab another one from the storage area and you’re good to go. If you’re pouring a large amount of concrete you can have 3-5 bins spread out in the washout area so the trucks won’t have to wait. When the day is over, simply put the lids on and move them to a storage area or wherever is convenient.